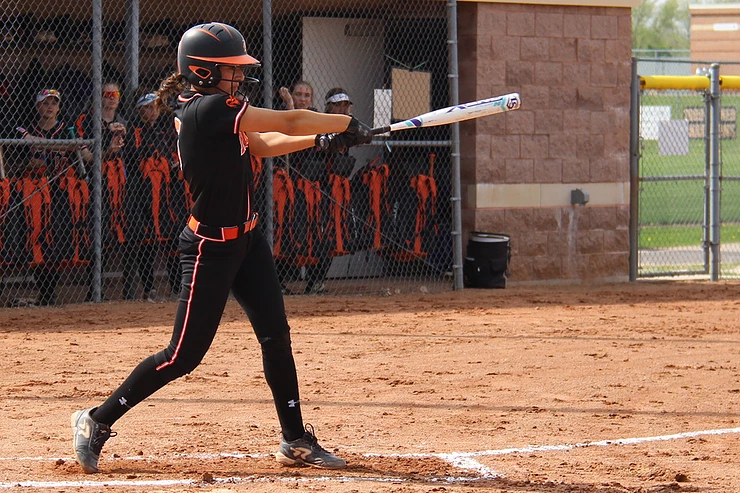 The Rockford varsity softball team competed in the Mandy Tichelaar Invitational at Cherry Creek Field, Friday, May 18. Rockford came away with one win and one loss on the day. In the Ram 16-8 victory over Zeeland West, Rockford showed hot bats collecting an impressive 17 hits for the game. Three Rams - Lily Guerra, Lauren Lanphear, and Kylie Winkels each tallied three hits for Rockford. Winkels collected one single, two doubles and registered three RBI to pace the Rams. Guerra, Lanphear, Addison Binney, and Chloe Bowen each tallied a double, with Lanphear and Bowen each earning three RBI for the Rams. Rockford’s Hannah Schinker earned the win in the circle, giving up eight runs on four hits. The Rams fell to Lowell in the second game by a score of 9-3 in five innings. Rockford was able to tally six hits against some potent Lowell pitching, leaving six runners on base. The Rams were led offensively by Winkels, who was able to tally two hits for the Rams. Guerra and Bowen each recorded a double for Rockford, with Guerra and Madison McCann each earning an RBI for the Rams. Rachel Foster took the loss in the circle for Rockford, giving up nine runs on 10 hits.